It is an honor to address the Special Committee on Peacekeeping Operations. I would like to begin today by paying tribute to our peacekeepers. Since the United Nations deployed its first peacekeepers in 1948, brave men and women from across our world have served this organization, with honor, dedication, and a willingness to put their own safety at risk for the high-ideals of the United Nations. Through their work, the image of the blue helmet has become synonymous across our globe with courage, impartiality, and security. The symbolism of the blue helmet crosses language, cultural, racial and religious divides bringing hope to communities affected by war. Of the millions who have been in the ranks of UN peacekeepers, more than 3,500 from 126 countries have made the ultimate sacrifice while serving under the UN flag. We are forever in their debt, and that of their families, and the nations from whence they came. The public measure of our success in peacekeeping is tied to our achievements, and indeed to our failings. We are judged by our record in maintaining international peace and security, and in protecting civilians from mass atrocity crimes. It is vital for the credibility of our organization, and for the security of the people we serve, that we give our peacekeeping missions the highest possible chance for success. Trust in the UN’s ability to deliver on its role in maintaining peace must always be maintained, and this calls for responsible leadership and accountability at all levels. In this context, this year’s Session of the Special Committee takes place at a critical juncture for United Nations peacekeeping. Secretary-General Guterres has laid out his commitment to reform the UN’s Peace and Security Strategy, Functioning and Architecture, to put an emphasis on conflict prevention, and to implement the ‘sustaining peace’ concept throughout the organization. Therein lies tangible opportunity for strengthening the hand of UN peacekeeping, for identifying the best organizational, governance, policy, and funding structures to support our work. I urge you all to make the most of this opportunity, to bring bold and innovative new ideas to the table in our common cause in support of the blue helmet, and to rally behind the Secretary-General’s efforts. I suggest for your consideration a number of critical areas we must consider, as part of our efforts to enhance UN peacekeeping. First, we need to support efforts to implement key reforms emanating from the High-level Independent Panel on Peace Operations and the Secretary-General’s related recommendations. This support should extend to the UN reviews on Peacebuilding, and Implementation of Security Council resolution 1325. It includes enhancing leadership and accountability in the field; strengthening collaboration and coherence in policy decisions and programme delivery among UN agencies, both at Headquarters and in the field; and ensuring that a ‘sustaining peace’ perspective is incorporated into all UN activities. Second, we must recognise the increasingly complex operating environments in which our peacekeepers are called to serve, and ensure that they are provided with the capabilities, training, skills, technology, equipment, intelligence, as well as the clearly-defined and well-funded mandates they need to succeed. This includes by considering ways to address emerging threats, and support their safety and security in the field. And it includes consideration of the tools and means necessary to respond effectively to threats of terrorism and violent extremism. Third, we must take proactive efforts to recruit, retain and promote women in peacekeeping, including at leadership levels. This is not merely a matter of equality, it is an operational imperative to ensure our forces encompass the diverse skills and perspectives needed to succeed. Fourth, we must broaden our strategic collaborations between the UN and other relevant regional and sub-regional partners, as part of our joint efforts to consolidate peace, maintain stability and support post-conflict reconstruction efforts. This is particularly important in Africa, which has hosted most of our peacekeeping missions. And finally, we must recognize the positions of great trust that our peacekeepers occupy in the field, and hold them to the highest standards of ethical behavior and discipline, including through adherence to the Code of Personal Conduct for Blue Helmets, the Zero Tolerance Policy for Sexual Exploitation and Abuse, and by following both the letter and spirit of Mission mandates. In instances where misconduct occurs, accountability must follow without delay. 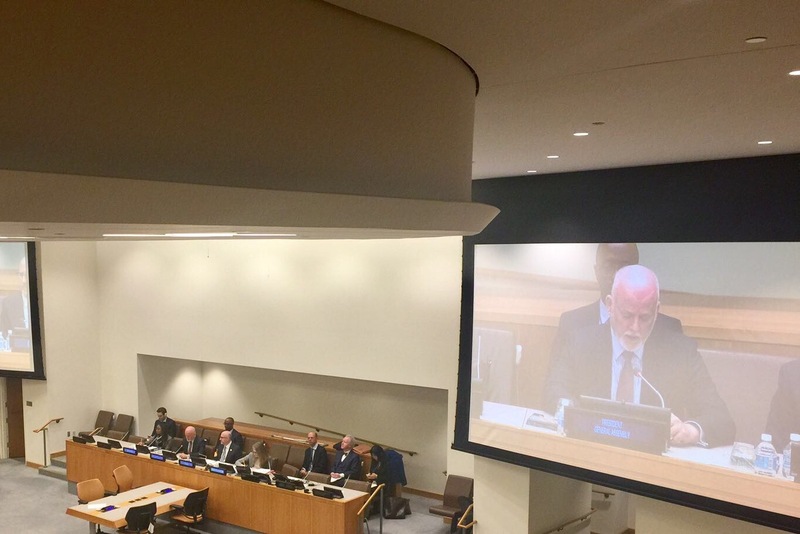 In today’s complex and interconnected world, it is critical we recognize the vital role that multidimensional peacekeeping missions play in advancing the other pillars of the United Nations work, namely sustainable development and human rights. Indeed, during the High-Level Event that I convened on 24 January on the topic of ‘Building Sustainable Peace for All’, the interconnected nature of peace and security and sustainable development efforts was recognised through the often quoted mantra that “there can be no sustainable development without sustaining peace, and there can be no sustaining peace without sustainable development”. Thus it is that I urge you to recognise the critical role UN peacekeepers play in achieving all of the most fundamental ambitions of our institution, including the implementation of the 2030 Agenda for Sustainable Development, and the historic promise it holds to transform our world for the better for people, planet and prosperity. Since the United Nations sent its first peacekeepers out on missions of peace, our organization has been engaged in a process of continuous deployment, in ever more challenging and complex settings. In the circumstances I have described to you today, this Committee has a special window of opportunity to improve and enhance the structures and conditions in which the blue helmets function, thereby ensuring that our peacekeepers can better serve the advancement of peace and security around the world. I wish you all the best in your deliberations for the remainder of the Session ahead.